Immanuel’s Endowment Committee invites YOU and your loved ones to attend this FREE, resource-rich event. WHO: For persons of ALL ages. It’s never too early to plan. Have you prepared your will? What about your Healthcare Directive or Medical Power of Attorney? Perhaps you’re wondering how you can share a small portion of your estate with the church. If any of these matters are on your mind, then this event is definitely for YOU. We like to call it – Planning for the Rest of Your Life. At this event you will meet . . .
Brian and Kathy Derry, who will share tips on how you can bring your family members together ‘around the Kitchen Table’ to have an important conversation about Healthcare Directives and Medical Power of Attorney if you can no longer make medical decisions for yourself. Mindi Hogan will join us from Hospice of Missoula and share information about the blessings that Hospice brings to families when they are going through the dying process of a loved one. Tim Geiszler will present an attorney’s perspective on will preparation and estate planning. Jim Stauffer (Thrivent Financial) will present charitable giving strategies. Our own Tim Wolsky will share some amazing stories about what Immanuel’s Endowment Fund is doing. And, what about your funeral? Having a funeral plan is such an awesome gift to your surviving family members. Pastor Molly will share her perspective. After the presentations, all of these folks will be available to visit with YOU in round-table or one-on-one conversations regarding next steps. Need a ride? Please call the church office 549-0736, and we’ll arrange to pick you up. Childcare will be available, and refreshments will be served. Planning is so critical in everything we do in life – from babies to career and from college to retirement. 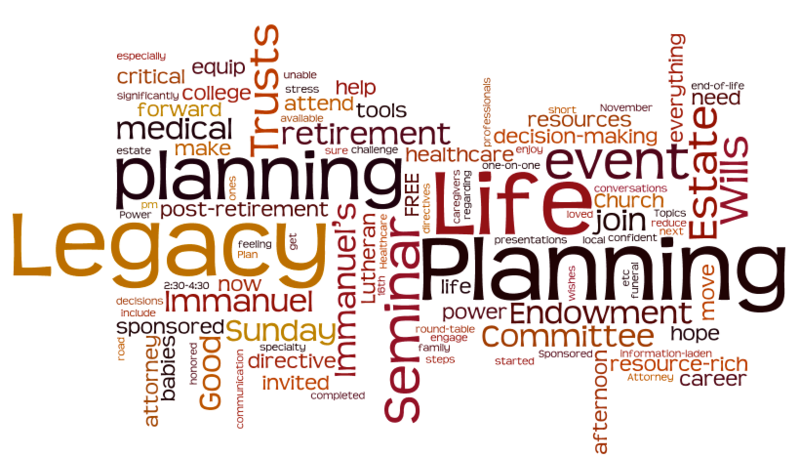 This Life Legacy and Planning Seminar will equip you with tools and resources you need to move forward with Planning for the Rest of Your Life. We hope you will join us.